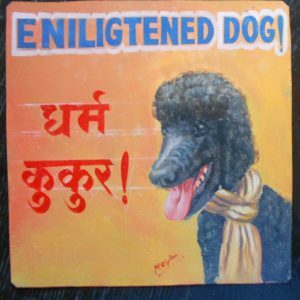 Rasta the Black Standard is an Enlightened Poodle in his hand painted portrait by Megh Raj. The chalk marks are easily erased. I just leave them on so that you can see the process. 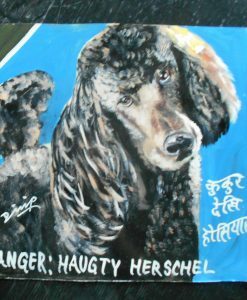 The Nepal Art Studio hand painted this portrait of Collette the Black Standard Poodle on metal. 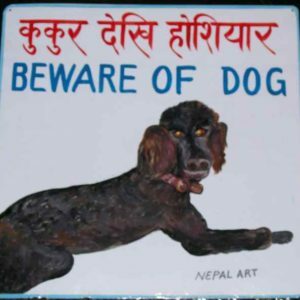 This is a classic example of Nepalese beware of dog signs. 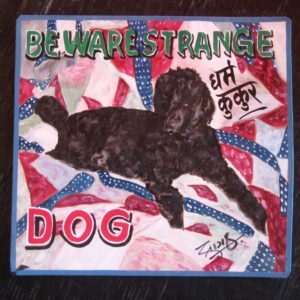 It is 12″x12″. 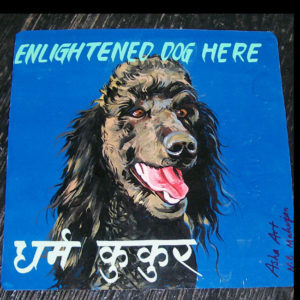 Riley the Black Standard Poodle is hand painted on metal by Nara, a sign painter in Kathmandu, Nepal. 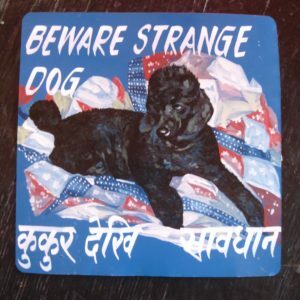 Sagar hand painted this portrait of Freddie the Strange Black Standard Poodle. 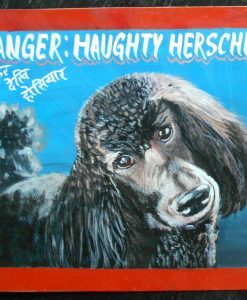 A lovely tribute to a noble breed. 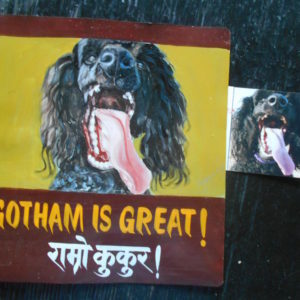 This hand painted portrait of a Black Standard Poodle is hand painted on metal using acrylic paint by Sanjib Rana, the only one of my artist who is considered a fine artist in Kathmandu. 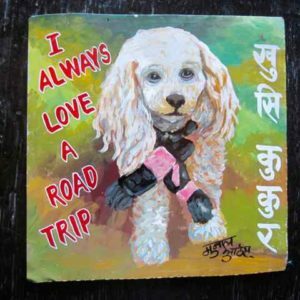 This folk art portrait of Cesar the Groodle is hand painted on metal by Megh Raj Thapa. 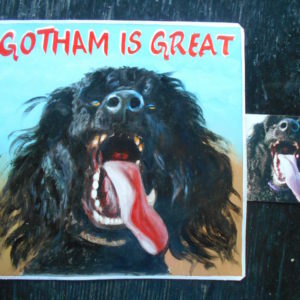 A Groodle is a cross between a Poodle and a Golden Retriever. 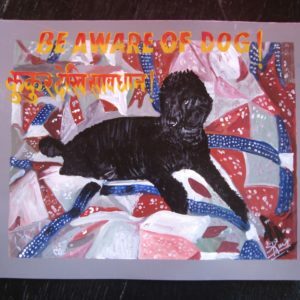 This is Frankie the Black Standard Poodle on her colorful quilt. 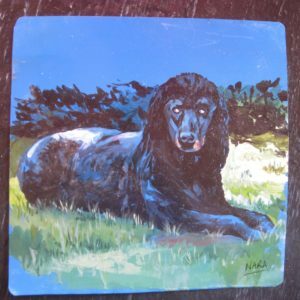 GG the Black Standard Poodle is lovely in her portrait by the artist Nara. 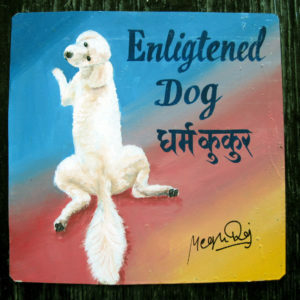 Spartacus the Grey Poodle is hand painted on metal by Megh Raj Thapa. 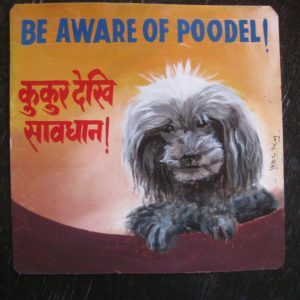 The misspelling of Poodel adds to the charm of this 12″x12″ portrait. 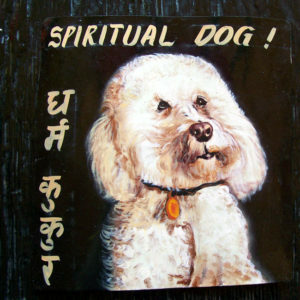 Louis the Spiritual Danger Dog by Baba. 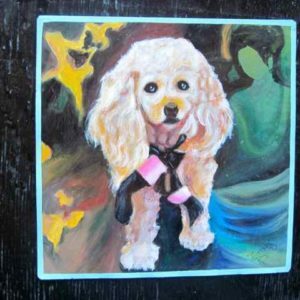 Set against a black background, Louis the white Bichon Frise is wearing an orange dog tag.